Darebin is one of Melbourne’s most culturally diverse suburbs. The proposed work, entitled ‘Cove Knot’, seeks to celebrate the rich diversity of the community through a twisting and interweaving form that produces place. This is intended to be analogous to the way that the comings together of a range of peoples have made Darebin home through a celebration of intertwined cultural richness. ‘Cove Knot’ symbolises the cultural interweaving of Darebin’s culturally rich community through its form, and yet does not remain a mute object as it also provides a place of sanctuary. As an asset to the park it provides shelter from the sun and rain, a place on high (the Hill) for parents to watch their children at play, or a simple quite place of retreat, hence the reference to cove in the title. 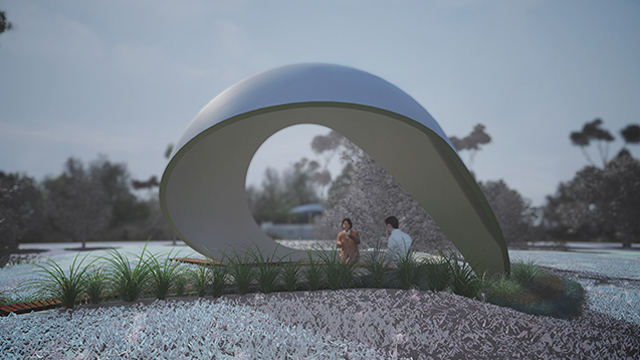 The work is orientated in such a manner that the leading edge of the overhead shell structure casts a shadow that is mapped against the curling seating within. The intention of this is to register the changing of time, much like a sundial, in order to signify the importance of Darebin’s past, present, and future. It is intended that the mapping of significant historical events and the growth of the community through the various waves of settlement will be physically identified in the seating and become activated by the tracking shadow of the sun. A significant driver in the conception of this work is Ray Bramham himself after whom the Garden is named. As an engineer Ray Bramham understood the practical relationship between the generation and construction of form and its function. In this manner the form of ‘Cove Knot’ is derived from a simple single curvature. The simple geometry registers a deceptive purity of form that beguiles its apparent complexity. For this very reason the structure is readily buildable. Advice to this effect has already been sought from two contractors. The structural materials are appropriate to their use. 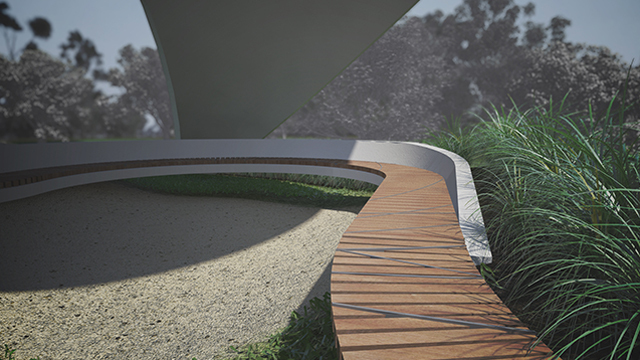 The arched shell utilises concrete to its full potential to achieve an elegant curvature of only 100mm thickness. Hardwood timber is utilised within the shelter of the cove to form comfortable seating. The two principle materials are played off one another to create moments of compliment and difference. ‘Cove Knot’ has been structural designed in collaboration with an engineer to specifically address both its inherent geometry, and as a lightweight, self-supporting structure. The process of production is planned as the construction of the formwork for the concrete shell off site. The formwork would be delivered to site, and the concrete cast in-situ in a single day following preparatory ground works. The timber seating elements would also be pre-fabricated off site, to ensure a high quality of finish, and are to be installed upon the completion of the concrete shell. The materials and structure are designed for durability and ease of maintenance.